There are many different sizes of pool/billiard tables and knowing your measurements can save you money and heartache. Different pool table manufacturers use different width rails, so the industry standard is to measure your playing field. You should also know that a seven-footer isn’t truly 7′, an eight-footer isn’t really 8′ and so on. Some people also are convinced they have one size and they really have another. Take your tape measure and measure in inches between the cushion noses on the short end of the pool table (see the photo of an 8′ right). Don’t measure under the cushion or inside the pocket. The length is typically double the width, but if it makes you feel better you can measure lengthwise, too. So, you aren’t sure if you have a one piece slate or a three piece slate pool/billiard table? It makes a huge difference if you are moving a pool table, especially when there are stairs involved. Take a look underneath the rails on either side of the side pocket. If you see a separation like in the photo to your right, you have a three piece slate pool table. If you don’t see a separation, you can look underneath the table for two support cross beams. Two cross support beams usually mean your pool/billiard table is a three piece slate, but not always. All newer pool tables, from the late 1980’s to present day usually have a three-piece slate bed. Many billiard tables manufactured from the 1960’s to 1980’s used one piece slates, but not all. All nine footers never have a one piece slate except Diamond coin operated pool tables. Most all seven and eight-foot coin operated pool tables have one piece slates. Some antique billiard/pool tables have a four piece slate bed and we have yet to see a table that has a two-piece slate. Still not sure? Give us a call and we can try and help you find out. Hopefully, before you get the expensive surprise. Do I Have Space for a Pool Table? Download this handy gameroom sizing guide to help you plan your ultimate game room! 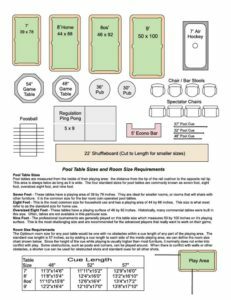 All of the sizing information on pool tables, shuffleboards, game tables, pub tables, and other game room furniture are to scale. Find out beforehand if you have space for a regulation size pool table and a Foosball, or if a 7′ billiard table with a pub table and two bar stools is what your space will allow. Just because a pool table will fit in a room, doesn’t necessarily mean that there will be ample room to play. Our pool table room chart below should help you to plan your gameroom space a little easier. The dimensions below represent an ideal space, but remember if one or more walls in the room are open it can make all the difference. And, if you are short on space, don’t let it deter you. We can almost always find a solution to make your pool table playable. Standard cue sticks are typically 57-58 inches in length. But we can also supply you with cue sticks in shorter, custom sizes too! Connelly vs. Olhausen, Who Builds the Best Pool Table?